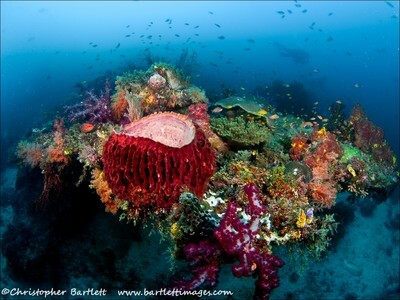 Established in 1994, Kri Eco was the first dive resort to open in Raja Ampat. The guest rooms, restaurant and lounge areas are located on the water for that relaxing feeling and sound of being close to water. Built from natural local materials, using local craftsmen and traditional design from the neighbouring villages, Kri Eco is a low environmental impact resort, and is designed to blend in with the natural surroundings. Click on the mpa to enlarge. 10 over water bungalows of a traditional Papuan design perched on wooden stilts, across from abundant reefs and pristine jungle, with excellent food and a relaxed, friendly atmosphere. The rooms have fans, a large table for photographers, and a bank of plugs. In the evening look west for sunset and in the morning watch the sun rise out of the sea to the east whilst an orchestra of birds sing amazing melodies. Nine bungalows have shared bathroom facilities shared by two cottages with a traditional mandi for washing. One room, the deluxe, has an en suite bathroom with shower. Three times a day meals are prepared in the open kitchen and are served on the communal table. A variety of local vegetables and fruits please vegetarian guests. Dishes are mainly local or Indonesian with fish and chicken featuring highly. Drinking water, coffee & tea are provided free of charge. Serve yourself at the honesty bar and a have a cool beer, soft drinks or fresh fruit juices. Watch the juvenile blacktip sharks grow up in the protected waters around the resort or just relax on the sun-deck. Max Ammer, the owner, has been diving these waters since 1992 and knows them intimately, having found many of the sites. More than 90% the staff are local Papuans. Many are ex-sharkfinners and dynamite fishermen but now work for Papua Diving and the staff are now active conservationists and protective of their natural environment. The current client relations manager, Ross, has been here since 2010 and has logged more than 2000 dives locally. He looks after you on site, plans where you go, keeps track of where you’ve dived, and guides almost every day. If you have anything specific on your fish wish list, he will do his utmost to make it happen. Diving is good all year round, with 30 dive sites within a 10-km radius. Viz ranges from 15 to 30 metres, and the water temperature remains at 28C to 29C throughout the year. Possibly assisted by being in the Dampier Strait where the Pacific Ocean meets the Halmahera Sea, Kri is home to the world-record breaking Cape Kri dive site where 274 species of fish were counted in 2012 by marine biologist Dr Gerry Allen. Giant mantas are found on several sites, most notably Blue Magic, from December to April. 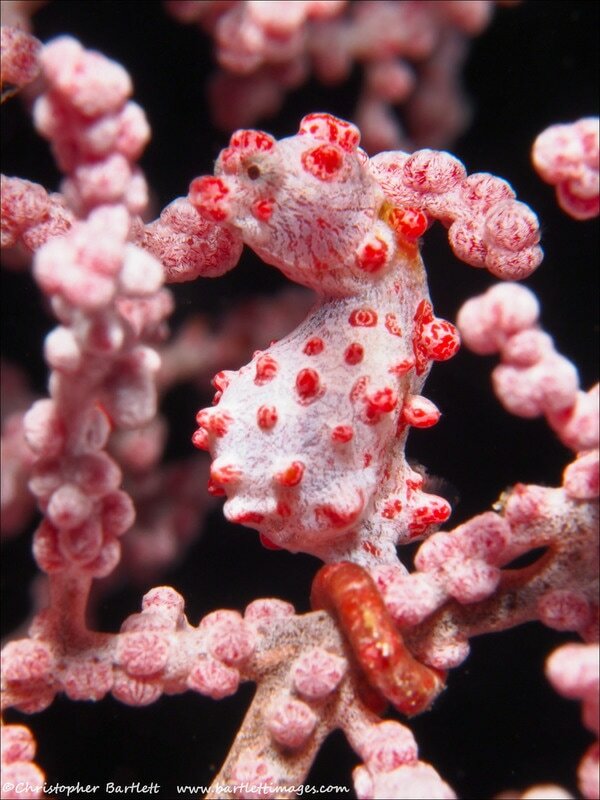 February is the busiest month and I saw at least nine different individual s on one dive there in February 2013. 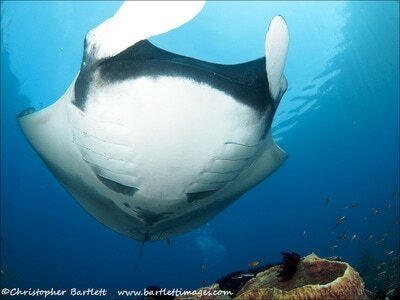 Weekly trips to the reef manta hotspots of Manta Sandy, Arborek, and Manta Drop-off are included. Long-range trips to the stunning Passage are noe included for free, as is a P47 Thnunderbolt wreck dive. A trip to the reefs of Fam Island can also be arranged for 60 euros per diver. 32% blend nitrox is free (if qualified). Each twin-engined dive boat takes a maximum of six guests with a minimum of two dive guides. 7, 14 and 21 night packages run from Sunday to Sunday. Free boat transfer from Sorong to the Island is available on Sundays only. Arrive Thursday and depart the following Sunday, or arrive Sunday and depart the following Wednesday. Arrivals and departure Monday to Friday may be possible but boat charges will apply (please see resort rates). Arrival and departure Saturdays is not possible.